I wasn’t originally going to review Voltax today. I was going to write about the new Salome CD Terminal, which is the metal album everybody’s talking about this month. (And when I say everybody, I mean everybody. Not just metal sites like Hellbound and Metal Injection, but NPR and the New York Times and the Financial Times.) And with all due respect to the band, the label (which has a really strong track record) and the writers behind all those pieces (one of whom is a good friend, and another of whom I’ve met in the past), I’m not convinced yet. I’ve listened, and I don’t hear it. So forget Salome. Let’s talk Voltax. This is Voltax’s second album, and it came out way back in February, but you’ve probably never heard of it, or them, until right now, so you’ve got no grounds to complain. One song from their self-titled 2007 debut appeared on the Earache Records compilation Heavy Metal Killers, but how many people noticed? Not many, I bet. Well, you’ve been missing out. 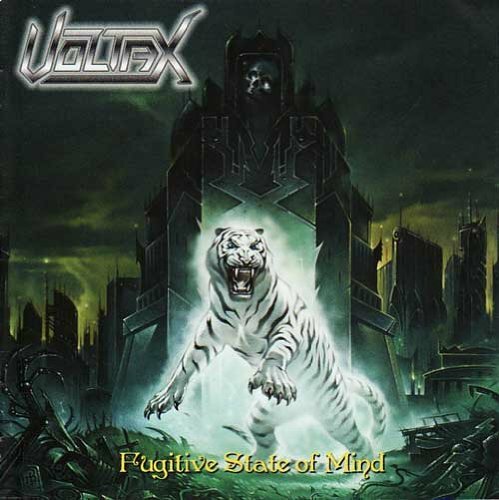 Voltax is a Mexican band, playing traditional heavy metal very much influenced by the 1980s. Their vocalist, Jerry, has a romantic voice that can work like a metal version of a ranchera singer, but at other times he employs a high-pitched, gravelly screech that sounds like a cross between Accept‘s Udo Dirkschneider and Scorpions‘ Klaus Meine. Guitarists Matt and Diego (nobody in this band has a last name) carve out primitive but spirited riffs that are equal parts power metal and proto-thrash, more like Accept’s “Fast as a Shark” than Metallica or Exodus. The solos are fleet but never so hyper-technical that they don’t sound like they were played by human fingers. Retro metal bands tend to also go for retro production; Washington State’s Christian Mistress is a great example of a band that sounds like four musicians (plus vocalist) in a single room, just going for it, and Voltax has that feel, too. Bassist Ganso and drummer Mario keep things propulsive and taut; Mario slams out the rhythm, keeping time on the cymbals as the bass drum whacks the listener between the ears. This is a short album; eight tracks in 33 minutes, one of which, “Vida Despues de la Muerte,” is a cover of a song by Megaton, an ’80s Mexican thrash band whose music I’ve never heard; they released one album in 1988 and then broke up. It’s easily the thrashiest song on the disc, clearly included more as a tribute to the previous generation than an indication of Voltax’s future direction or anything like that. “Vida” is also one of only two songs on Fugitive State of Mind sung in Spanish; the other is “Acero Inmortal,” which translates to “Immortal Steel” and thus is probably somewhere in Manowar territory, lyrically speaking. There’s a love song, but it’s called “Love is Hell” and it’s a rocker, not a ballad. These guys never slow down, from the album-opening “Unmerciful Reign,” which kicks off with powerful kick drum thunder and a riff that could have come from Mötley Crüe or Judas Priest, plus a truly piercing scream from Jerry, all the way to the full-speed-ahead gotta-get-out-of-this-town anthem “Midnight Wheels.” All killer, no filler, as they say. And do I even need to point out that mind-roastingly awesome album cover? It’s got a white tiger on it! A white tiger! There are a lot of Mexican and Mexican-American bands playing retro thrash, but very few working a traditional heavy metal groove. So kudos to these guys just for doing what they do; the fact that they do it very, very well is gravy. This is the kind of album you stumble across by accident, pop in the CD player, and pick your jaw up off the ground when it’s done playing. They’ve got no publicity budget, and they’re not gonna make it onto any metal magazine’s year-end list. So do yourself a favor and buy it, for hell’s sake.